Muhammad Suleiman thought it was safe to go home after the army drove militants from his town in northeastern Nigeria three years ago. In December, the militants struck again. Suleiman fled into the bush, leaving his voter card behind with most of his other belongings. The 28-year-old carpenter now fears he will not be able to take part in Nigeria's presidential election on Feb. 16. Though authorities say they will set up polling booths in the camp where Suleiman has taken shelter in the city of Maiduguri, in the state of Borno, only those with voter cards will be allowed to cast ballots. "I want to vote," he said. "We have to live here, so hopefully we can vote here." Insecurity is rampant across Nigeria, Africa's most populous nation with 190 million people and its largest oil producer. In the northeast, a surge in attacks by Boko Haram is throwing election plans into chaos. Tens of thousands of people have fled their homes since December in a region already sheltering 1.8 million displaced people, according to United Nations figures. 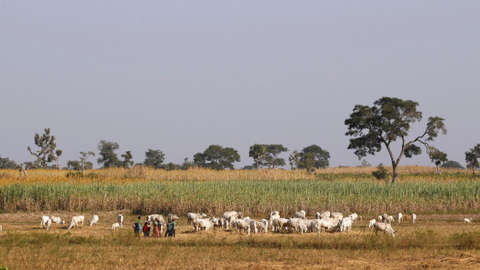 In Nigeria's central states, clashes between farmers and nomadic herders over dwindling arable land have killed thousands of people and displaced tens of thousands more. Thousands have also fled in the northwest, rendering swathes of the region inaccessible even to the military. Sharon Ogunleye has more details. The bloodshed is a challenge for President Muhammadu Buhari as he seeks a second successive four-year term. Buhari, who was also Nigeria's military ruler for 20 months in the 1980s, was elected in 2015 partly on a promise to restore security. "Our politicians -- we voted for them, we brought them into power. 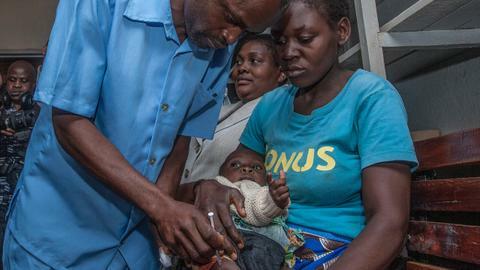 But once they're in power, they don't take care of us," said Bulama Kyari, a community leader who fled an attack on the northeastern village of Kekeno in December. "Before, I had confidence in Buhari and voted for his party, but now I don't support any of them." 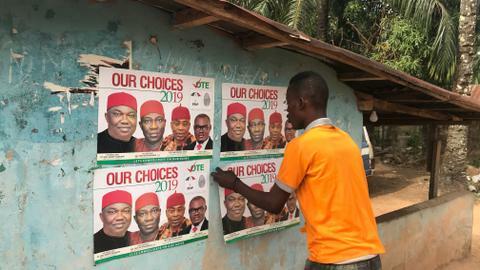 The northeast is a traditional support base for Buhari, who is now 76, but violence is making it more difficult for his All Progressives Congress party to turn out the vote this year. "I would vote for President Buhari," Suleiman said. "But we left our voter's cards." Buhari's main rival, businessman and former vice president Atiku Abubakar, has criticised his security record and said in his manifesto that he would use diplomacy, intelligence and border controls to tackle the militants. The government and military have tried to return the displaced to their homes in time to vote, but some said they were sent back against their will. Others preferred to take their chances at home rather than in the teeming camps. Daesh and Boko Haram have both stated they plan to disrupt the election by conducting attacks, the United States Embassy said in a statement in January. Attacks also surged in the run-up to the 2015 election. Many of the newly displaced say soldiers dropped their weapons and fled when Daesh or Boko Haram arrived. Some said the insurgents killed soldiers they discovered fleeing with civilians. The Nigerian defence headquarters did not respond to requests for comment. 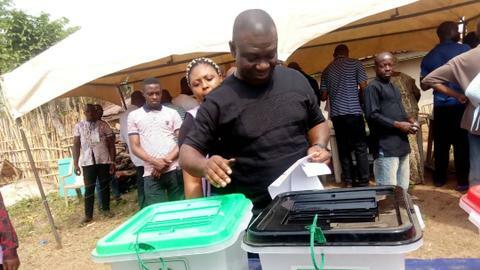 A spokesman for the army commander responsible for election security in the northeast said the officer was busy on operations. The military has said that only insurgent "remnants" are left in the northeast. In Borno, the state worst hit by the decade-old insurgency, electoral officials have been carrying out voter registration drives in the camps and in towns where people have fled. But the effort is fraught with problems. "Where we don't have security or peace, voting won't prevail," said Mikah Lakumna, an official with the electoral commission in Borno. Last year, he said, the air force flew election officials into the remote town of Rann near the border with Cameroon. But efforts to register voters and preparation for the election collapsed last month when Boko Haram fighters overran the military and tens of thousands of people fled. "The structure crumbled," Ya Bawa Kolo, head of Borno State Emergency Management Agency, said of the effect of the recent attacks on electoral commission plans. "We will try our best to see how we organise all these scattered locations and a scattered voting population." Lakumna said a plan was being worked on to allow people who have lost their voter cards to vote but that details had not yet been finalised. Election observers worry that people streaming into displacement camps could exacerbate vote-rigging. There was widespread vote-buying in such camps in 2015. In Maiduguri, the camps swarm with tens of thousands of new arrivals. Men and women clamour at the windows of an electoral commission booth, hands outstretched with slips of paper containing the information needed to get their voter cards. "The electoral commission told us we would vote in our home towns, but now we don't know what the plan will be," said Modu Awwame, a community leader from the village of Cross Kauwa, who fled to Maiduguri in December. "The commission doesn't know what the plan is."